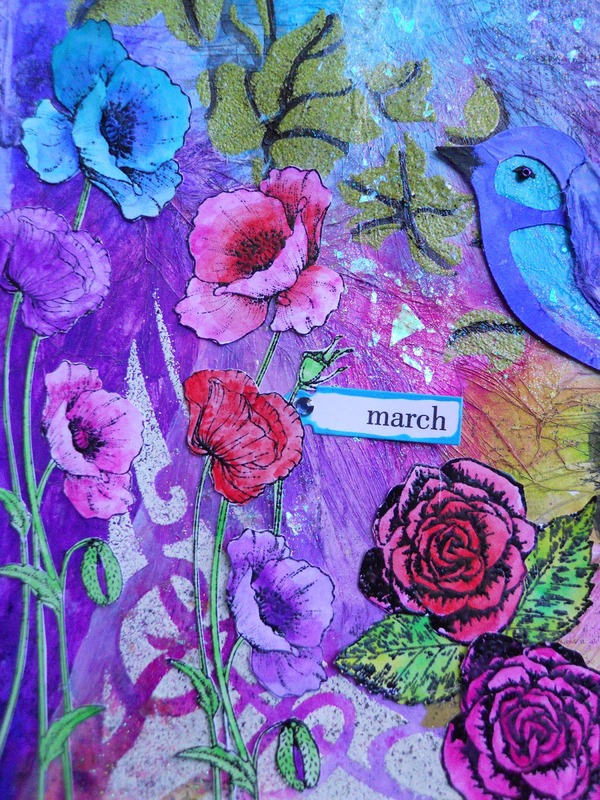 Today we welcome the first day of Spring, in all of it's splendor, with the flowers, birds, and colors, inspiring hope and new beginnings! 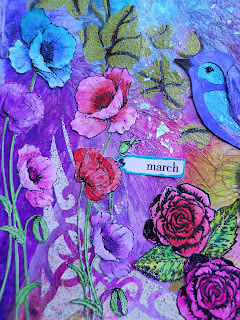 Drea here with an art journal page to start off the season with some Dylusion's Paints and other mixed media from FotoBella.com. 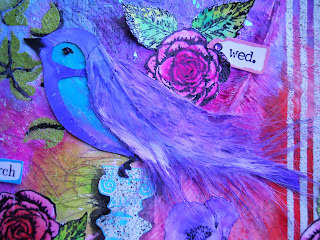 To the background, I glued down three craft feathers, and covered them with Prima Marketing Gesso (White). After drying, I used a paintbrush to apply Dyan Reaveley's Dylusion's Paints (Vibrant Vibrant Turquoise, Calypso Teal, Rose Quartz, Bubblegum Pink, Fresh Lime, Postbox Red, After Midnight, Crushed Grape, and Laidback Lilac). 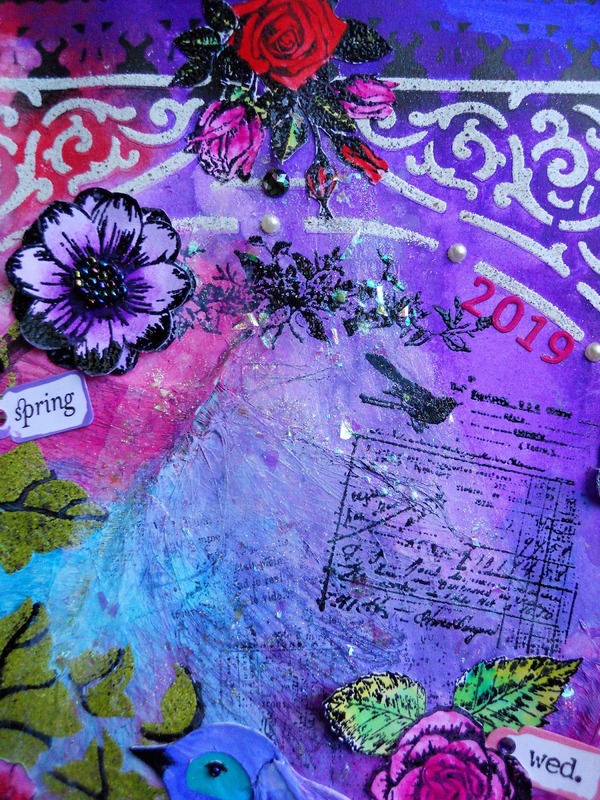 Then I applied the same gesso to the Stamperia Alchemy Moon Stencil, omitting the moon and stars, and turning it upside down, to frame my page. 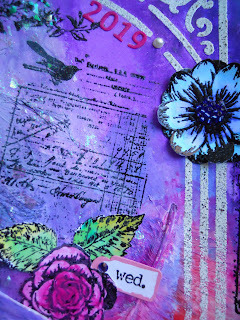 I later embossed over it with Ranger Mixed Media Powder (Bone). The leaves trailing down, were done with the Stamperia Lemons Stencil by applying gesso, and embossing with Ranger Mixed Media Powder (Lime). 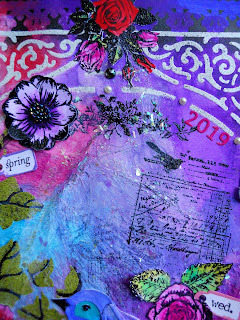 To add shadows, I outlined it with Dylusions Paint (Black Marble), also used with a Mini Blending Tool on top, to create the borders using an old Tim Holtz Mask. 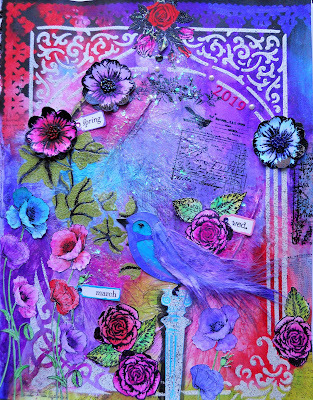 I also used the Mini Blending Tool with Dylusion's Paint (White Linen) to create a ray of light onto the bird, followed by Prima Marketing Finnabair Unicorn Paste, which has beautiful chunks of glitter. 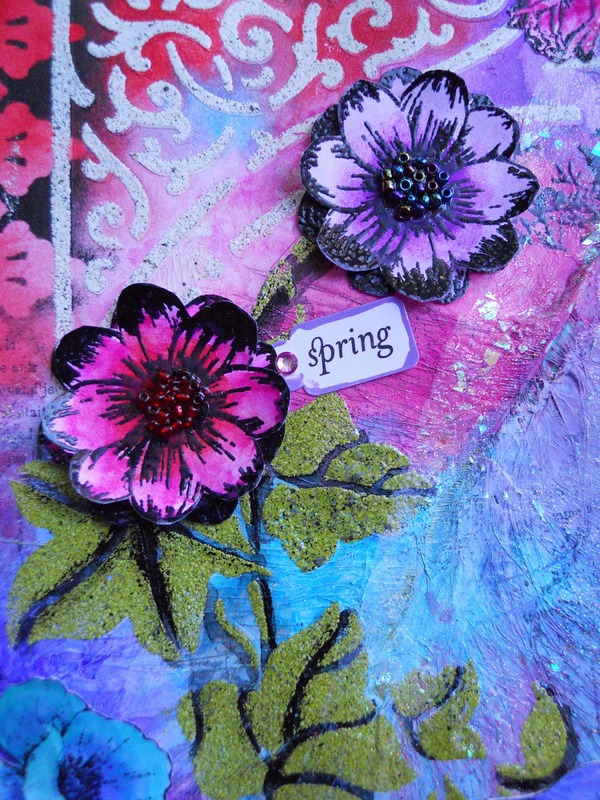 The flowers were embossed with the Bo Bunny Floral Stamp, Prima Marketing Garden Fable Stamp, and the Stamperia Poppies Stamp, colored with the same paints, with beads added to some of the centers. 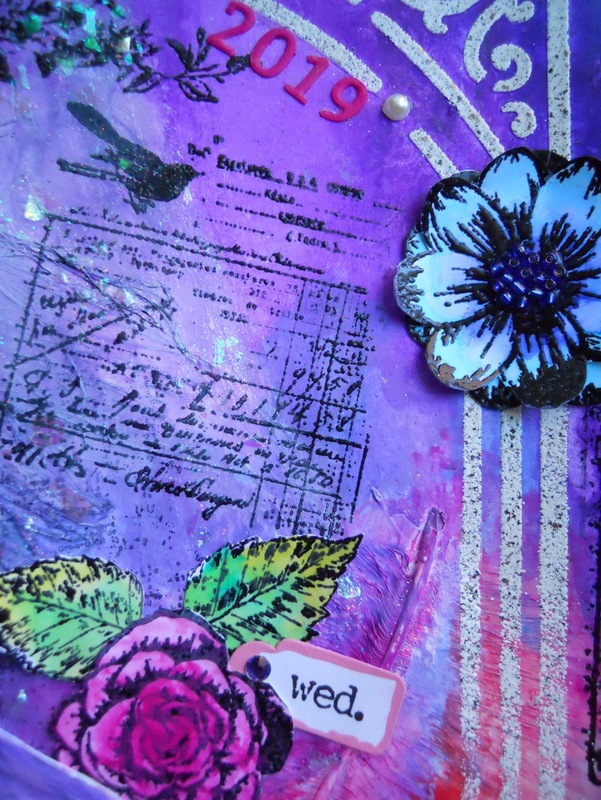 All of the black embossing was done with Emerald Creek (Black Cherry) EP, with some of the new Prima Marketing Finnabair Stamps (Clear Stamp #4 and #5) used on the background. I love the poppies, colored with the same paints from the background! But the star of this page is the bird, cut with the Cricut Expression (Home Decor cartridge) onto white cardstock. 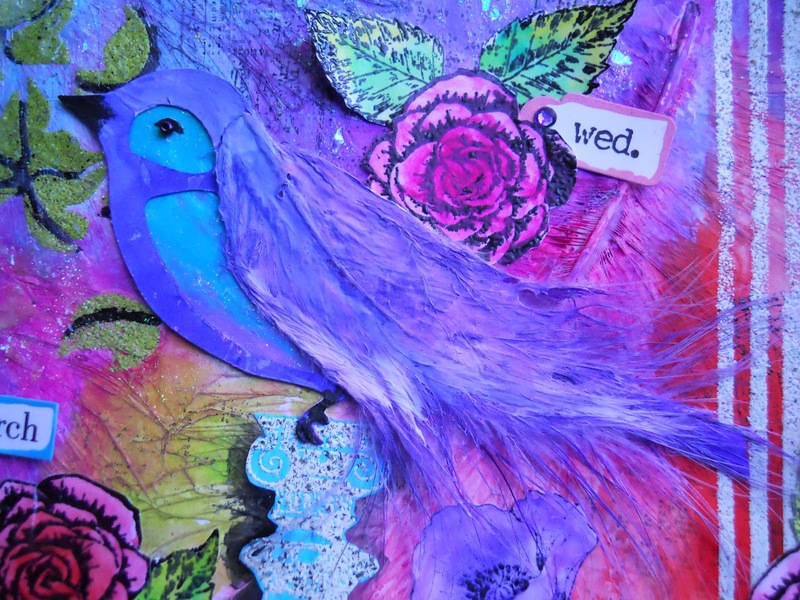 Then I added a feather to the top layer wing, covered it with gesso, and colored it with Distress Spray Stains (Blueprint Sketch and Wilted Violet). 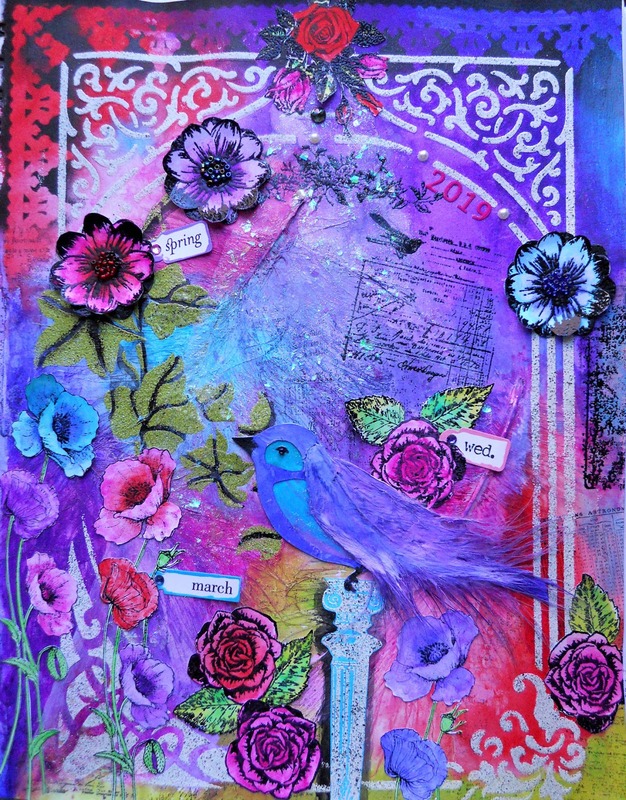 The rest of the bird was colored with Dylusion's Paints, with Prima Finnabair Unicorn Paste added to the bottom layer. 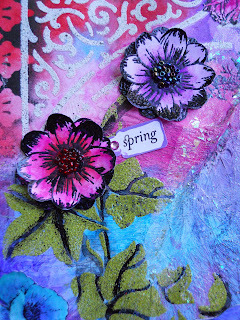 Thanks for looking, and shop FotoBella.com to see what Spring inspires you to create!